Some advocates for corporate tax reform believe it is possible to create an environment in which corporations would have fewer incentives and less opportunity to avoid paying U.S. taxes. With remarkable consistency, these advocates argued that the most important measure the U.S. could take would be ending its deferral policy. “The answer is to get rid of the rule that encouraged all the corporations to shift all their profits offshore in the first place, which is deferral. Until then, you’re going to still have a system where corporations have some sort of incentive to do that,” said Wamhoff. A bill that would end deferral is currently on the floor of the U.S. House of Representatives. The Corporate Tax Fairness Act, developed by Senator Bernie Sanders (I-Vt.) in the Senate and Representative Janice Schakowsky (D-Ill.) in the House, was referred to the House Committee on Ways and Means in February, 2013, where it currently remains. The bill has only three co-sponsors: Representatives Keith Ellison (D-Minn.), Alan Grayson (D-Fla.), and Raul Grijalva (D-Ariz.). And what would be the most important tool the U.S could use to reclaim the money lost to tax avoidance? “Really the big thing would be just to end the deferral of foreign source income and tax them for it,” Rep. Schakowsky said. Sounds great, but the article fails to mention the experience of New Zealand, the only developed country to try such a policy. 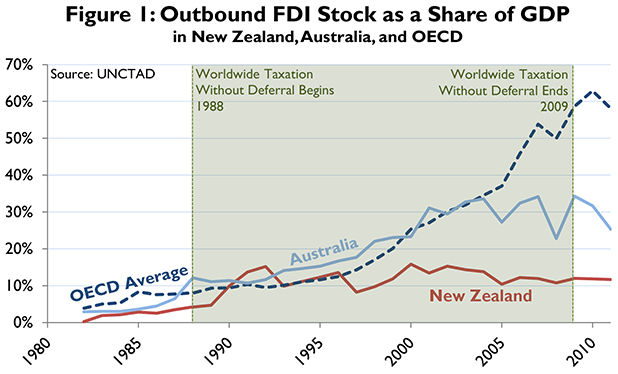 After ending deferral in 1988, New Zealand suffered a 20 year stagnation in foreign investment, which contributed to a concomitant decline in economic output and living standards, as the charts below illustrate. 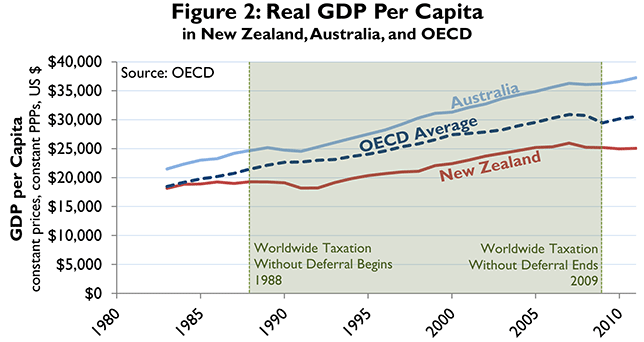 For these and other reasons, in 2009 New Zealand returned to a territorial tax system that exempts entirely the active foreign income of their multinational corporations. Read more about it here.